Welcome to the September 2017 issue of our occasional newsletters. For more than 3½ years, from June 1779 to February 1783, the tiny territory of Gibraltar was besieged and blockaded, on land and at sea, by the overwhelming forces of Spain and France. It became the longest siege in British history. 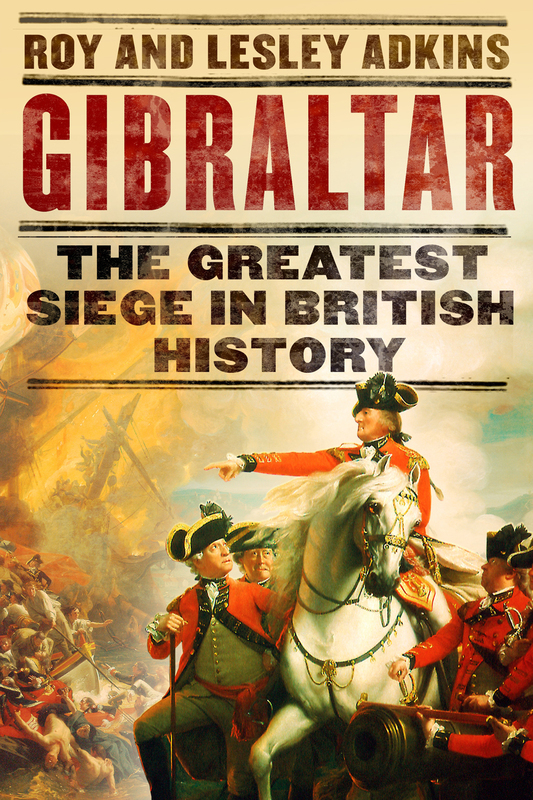 We relate this epic tale in Gibraltar: The Greatest Siege in British History. 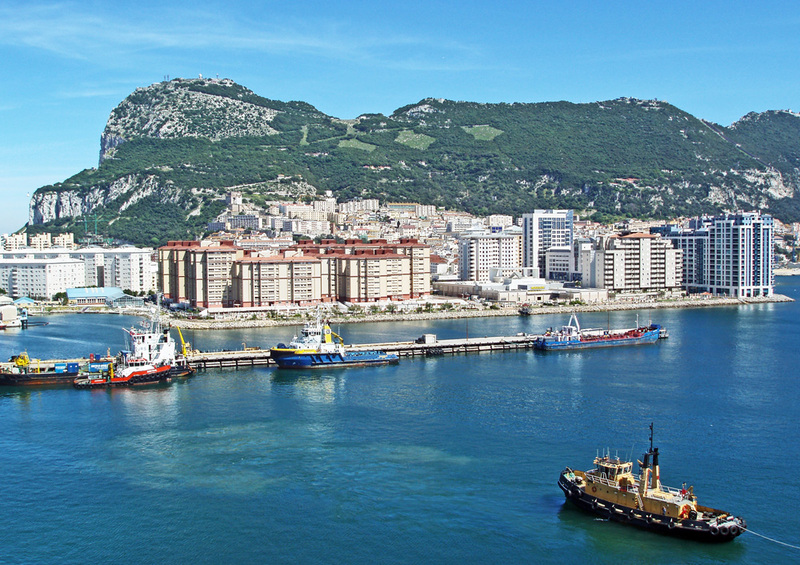 Located between the Mediterranean and Atlantic, right on the edge of Europe, Gibraltar was a British military garrison and home to several thousand civilians, a place of varied nationalities, languages, religions and social classes. Before the siege, life was particularly pleasant for officers, who often socialised with their Spanish counterparts, but even the ordinary soldiers considered it one of the best garrisons at which to be stationed. The easy way of life ended abruptly in June 1779, when Spain began besieging Gibraltar after joining forces with France against Britain in America’s War of Independence, also known as the American Revolution. When France sided with the American colonies and offered all sorts of help, they soon saw the possibility of destroying Britain’s sea power, but Spain’s naval support was needed. The French eventually persuaded Spain to unite against Britain in return for assistance in gaining Gibraltar and the island of Minorca. Spain also agreed to support a French invasion of southern England, where the main Royal Navy bases were located. The siege of Gibraltar, the siege of Minorca and the attempted invasion of England by an armada of French and Spanish warships were therefore all inextricably linked with the struggle of the American colonies for independence from British rule. 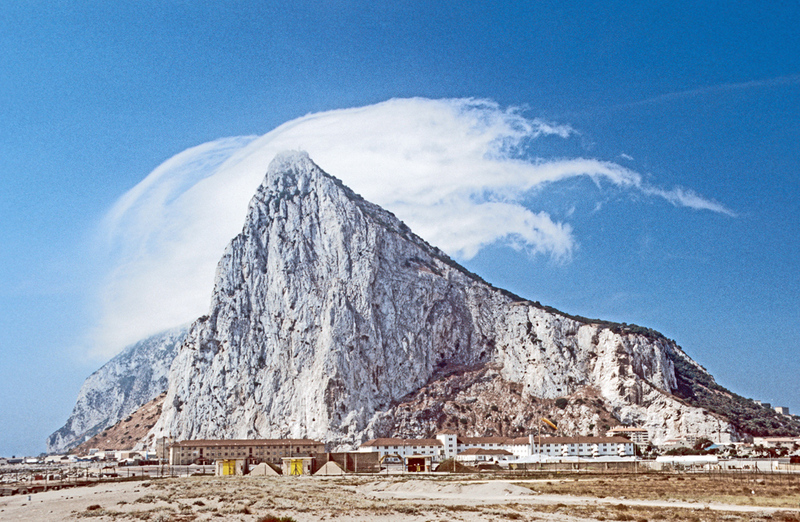 The British government’s obsession with saving Gibraltar was blamed for the loss of America. During the siege, soldiers, civilians and their families withstood terrifying bombardments, starvation and diseases. Very ordinary people lived through a succession of extraordinary events, including terrifying fireship attacks, a daring sortie out of Gibraltar and – the climax of the siege – an attack by floating batteries. This is military, naval and social history combined – a story of soldiers, sailors and civilians, with royalty and rank-and-file, engineers, spies and surgeons, all caught up in a struggle for a fortress located on little more than 2 square miles of awe-inspiring rock. It was Britain’s longest ever siege. On 29th August we gave a 15-minute live interview with Carrie Cooper for BBC Radio Jersey. We have a BBC radio and TV studio in Exeter, which is very useful for such interviews. Jersey was not immune from hostilities at this time, because the French tried to capture the island in May 1779 (just before the Great Siege began) and again in January 1781, when they landed a few hundred men at St Helier – but were defeated. You can hear the interview here for a short while (on the counter, it’s about 1.07). This year, 2017, is the 300th anniversary of the birth of George Augustus Eliott, who was governor of Gibraltar throughout the siege. Lieutenant-General Eliott had a long military career and was eventually honoured with the title of Lord Heathfield. During the Great Siege, he had overall control of Gibraltar, both the military garrison and the civilian inhabitants, and his strategic skill is credited with the successful defence of the Rock. He is still commemorated on Gibraltar today, but elsewhere he is a largely forgotten hero. 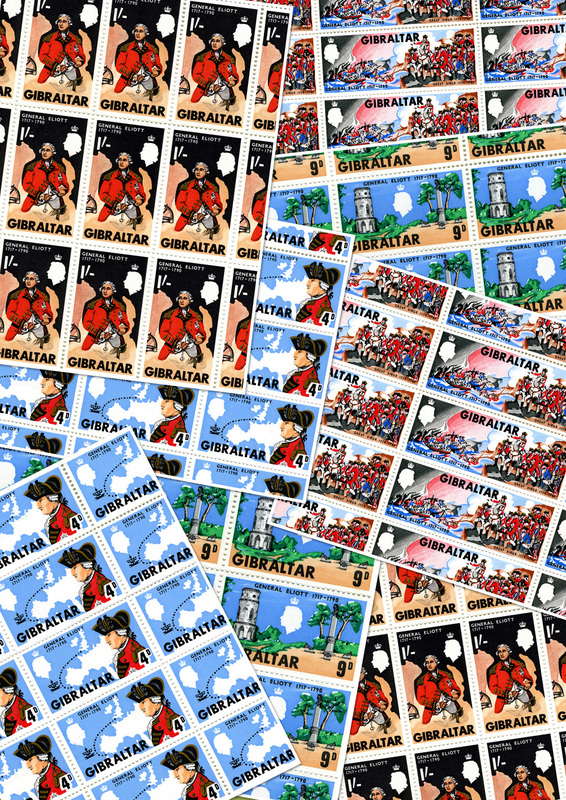 Gibraltar is famed for its philately, issuing beautiful postage stamps to celebrate aspects of life on the Rock. In 1967, on the 250th anniversary of the birth of Eliott, commemorative stamps were issued. One shows him holding the Gibraltar key; one has his portrait on a map of Europe; another depicts two monuments dedicated to him (at Heathfield in Sussex and Gibraltar); and one shows the scene on the Copley painting that is used on our book jacket. It is always pleasing to receive a package or letter from Gibraltar, adorned with lovely stamps. By contrast, the Royal Mail’s philately is lacklustre. There is virtually no advertising, and their special-issue stamps are now aimed at existing collectors, because of a decision years ago to stop second-class special stamps (except for small and nasty ones at Christmas). Their website shows that stamps have been issued in 2017 depicting ancient Britain, Windsor Castle, songbirds and windmills – wonderful, but we never saw any of them, yet would have bought them. For mid-September, there will be stamps to celebrate Ladybird books, and two are actually second-class. One includes the Ladybird book of Nelson – when Nelson should obviously be first-class. On 25 December 1717, Eliott was born at Stobs, just south of Hawick in the Scottish Borders, the youngest son of Sir Gilbert Eliott and his wife Eleanora. He was educated at Leiden University in Holland and at a French military college, followed by service in the Prussian army and further training at Woolwich. He was fluent in several languages and skilled as a cavalryman and as a military engineer. He took part in several notable battles, including Dettingen, Fontenoy and Minden. In London in 1748, Eliott married Anne Pollexfen Drake, sister of several Francis Drakes (who had different middle names to distinguish one from another). Eliott and Anne had two children – a son Francis Augustus and a daughter Anne. 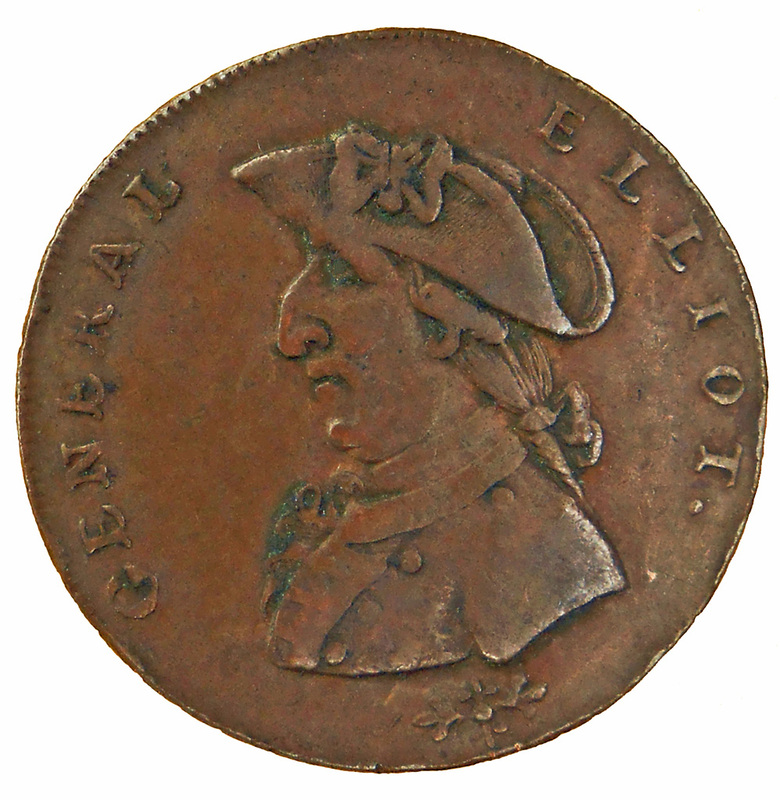 In 1762, Eliott was second-in-command in an expedition to Cuba and was awarded substantial prize-money on the capture of Havana, with which he purchased the Bailey (or Bayley) Park estate in the village of Heathfield in Sussex. To Eliott’s immense grief, his wife Anne died in 1772. Not long after, he became commander-in-chief in Ireland, but immediately resigned, and instead, in 1776, he was appointed governor of Gibraltar, arriving there in May 1777. He had a reputation as a strict commander, and so Captain Horsbrugh was relieved to find him very pleasant. Once Spain closed the border with Gibraltar in June 1779 and established a blockade, Eliott took firm control of the Rock and was at the very centre of all information filtering through to Gibraltar. A fit man of frugal habits, he was very active and energetic, known to rise early each day, regularly riding round the walls, inspecting the guards and defences, and impressing everyone with his vigilance and attention to detail. Even so, he had his detractors, but for Gibraltar as a whole, he was probably the best person to be in charge. When the siege ended in 1783, Eliott stayed on Gibraltar to carry out his duties. If he had returned to England straightaway, he would have had a hero’s welcome. Finally, in 1787, he travelled to London to receive a peerage, becoming Lord Heathfield, Baron Gibraltar. In London, he suffered a stroke, and during his gradual recovery he bought another large house, with 12 acres of land, at the rural village of Turnham Green, now part of Chiswick in London. The house is no longer there, though the name Heathfield survives in street names. 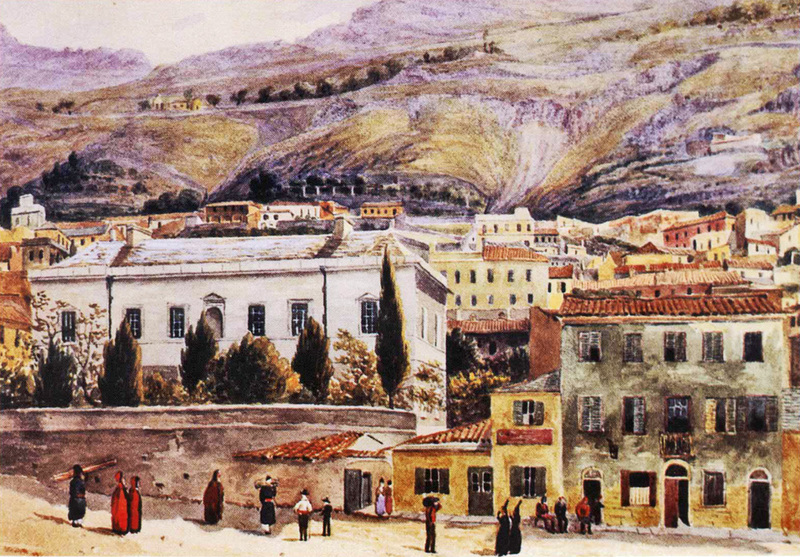 When Eliott suffered another stroke in 1790, he travelled to Aix-la-Chapelle to take the waters, from where he intended to travel to Gibraltar to live out his days. Instead, he suddenly died, and his body was brought home and buried in the church at Heathfield. It was later moved to the Drake chapel of Buckland Monachorum church in Devon, where his son erected an imposing monument celebrating both his father and the siege of Gibraltar. John Drinkwater was a more lowly officer, but one of the most interesting characters of the siege. He was born at Latchford near Warrington in Lancashire in 1762, and his father was a former naval surgeon who had set up a medical practice at nearby Salford, on the edge of Manchester. It was only natural, therefore, that if he was going to join the army, it was likely to be a local regiment. Once the French started helping the American colonies, a new wave of patriotism spread through Britain, with new regiments being recruited by private subscription, including the 72nd Regiment of Foot at Manchester. Drinkwater was a former Manchester Grammar School pupil who joined this regiment as an ensign in 1777. He was 15 years old, with no military experience, and this was the lowest rank of commissioned officer. Raised to serve in America, the 72nd Regiment was diverted to strengthen Gibraltar, which later recruiting posters boasted was ‘the best garrison in His Majesty’s Dominion’. 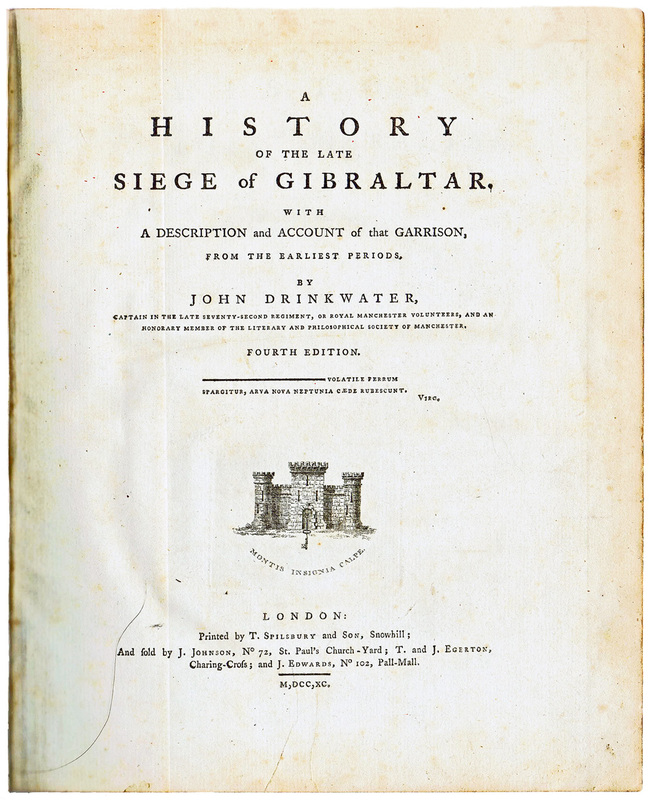 In connection with Gibraltar, John Drinkwater is best known for the diary which he kept throughout the siege. When it was over, he used this diary as the basis for a book called A History of the Late Siege of Gibraltar with A Description and Account of that Garrison from the Earliest Times, which was first published in 1785 and went through many editions. One or two short memoirs about the Great Siege had been published before, but Drinkwater’s book was the first attempt at a comprehensive account. It became a military classic and would remain the most popular book about the siege for years to come. On Gibraltar itself, Drinkwater is equally known for his connection with the Garrison Library. After the siege ended in 1783, the 72nd Regiment was ordered back to Britain and was then disbanded. 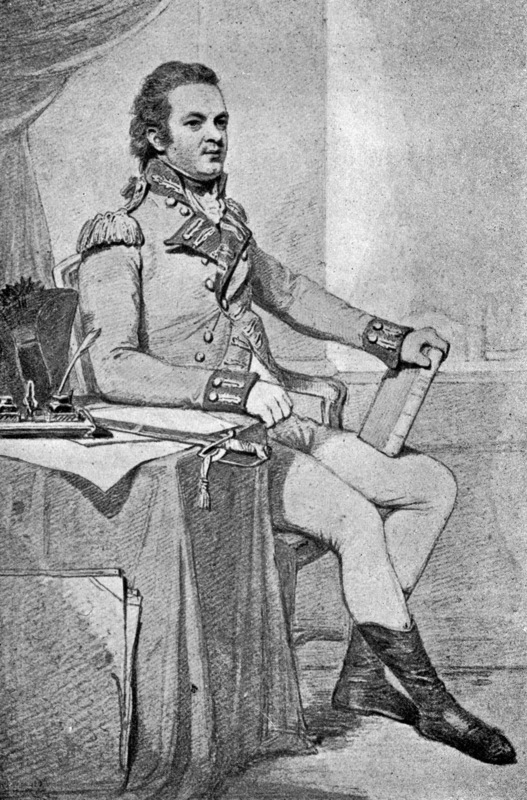 By now, Drinkwater had risen to the rank of captain, and in 1787 he became captain in the 1st or Royal Regiment of Foot, which was stationed at Gibraltar. He remained there until his regiment was sent to reinforce Toulon in France in 1793. During this second stay on the Rock, he established the Garrison Library, which became a model for similar libraries at other military stations. It was founded in 1793, and as more books were added, a purpose-built library was proposed. Its construction started in 1800, and the library was completed and officially opened in 1804. It is still a functioning library, as well as landmark historic building, and guided tours are available for visitors every Friday. As the war with Revolutionary France turned into the war with Napoleon’s Empire, Drinkwater went wherever his regiment was posted. In 1797 he was travelling on board a ship that became involved in the Battle of Cape St Vincent. By now, Drinkwater had risen to the rank of lieutenant-colonel. After witnessing the battle, he immediately published his own account, Narrative of the Proceedings of the British Fleet commanded by Admiral Sir John Jervis, KB, in the late action with the Spanish fleet. It was published anonymously, though Drinkwater acknowledged authorship in a new edition. His account drew attention to the crucial role of one man who had not been given due credit or even mentioned in dispatches, but had been eclipsed by Sir John Jervis. 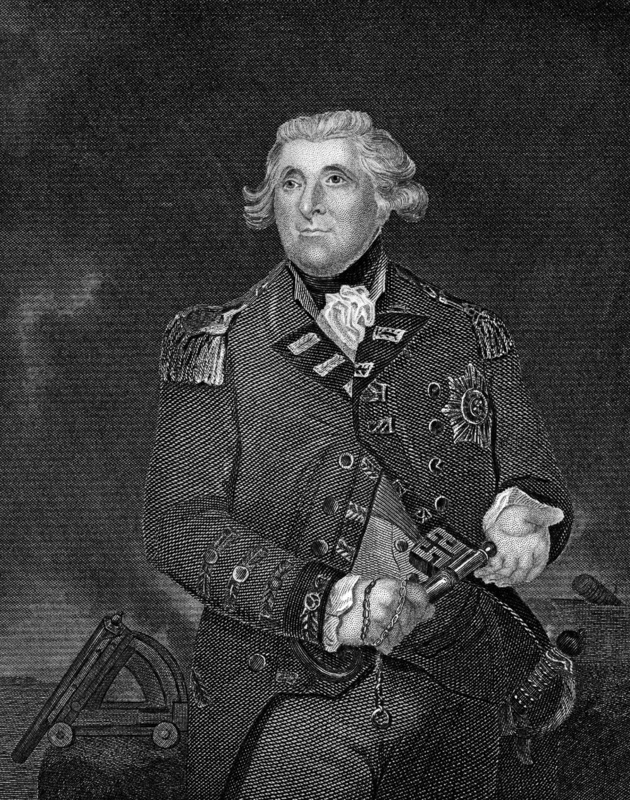 That man was Commodore Horatio Nelson. Towards the end of the Napoleonic wars, in 1811, Drinkwater was appointed comptroller of army accounts. He continued in this post until it was abolished in 1835, but he also had other interests. He continued to prepare and publish different works and fresh editions of his previous books until his death in January 1844 at the age of 81. He was buried in the churchyard at Leatherhead in Surrey. One of the projects with which John Drinkwater was involved after the Napoleonic Wars was the construction of the Regent’s Canal through London, which was begun in 1812 and completed in 1820. The Regent’s Canal was part of a grand plan of the architect John Nash to redevelop a large area of central London for the Prince Regent. Prince George, later King George IV, ruled as Prince Regent from 1811 to 1820 when his father, George III, was too incapacitated by mental illness. Like the canal, other parts of this scheme, such as Regent’s Park and Regent’s Street, were named after the Prince. The canal was designed to link the Paddington section of the Grand Junction Canal, which had opened in 1801, with the River Thames at Limehouse. Unusually for a canal just over 8½ miles long, it had several tunnels, the longest of which was the Islington tunnel at just over ½ mile long. 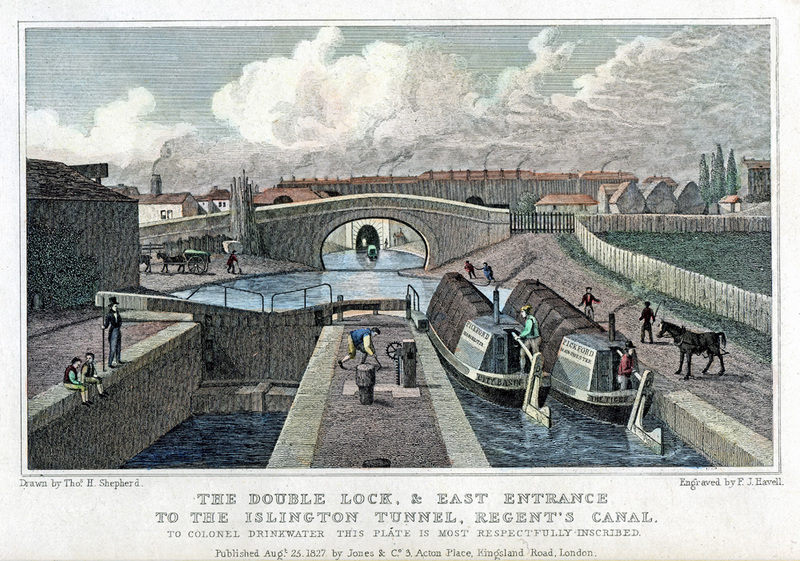 The print depicted below was published only 7 years after the Regent’s Canal opened and shows in the foreground what is now known as City Road Lock. The bridge in the middle distance is on the line of the present Danbury Street, and through the arch can be seen the eastern end of Islington Tunnel. The tunnel runs on an absolutely straight alignment for 969 yards (886 metres) and emerges by the Caledonian Road, not far from King’s Cross Railway station. What is unusual is that this print depicts part of an urban canal on a working day rather than the more common picturesque, rural views of a distant canal. Many of the routine tasks that kept the canals working (and which are largely forgotten) are shown or suggested. The first thing to note is the smoke coming from the chimneys of the canal boats (or narrowboats) on the canal. This is not smoke from steam engines, as they were not fitted to canal boats until much later in the 19th century. At this time, canal boats were drawn by horses, which would continue to be used well into the 20th century. The smoke came from small stoves in the cramped cabin where the boatman and his family lived – the stoves were used for heating water and cooking and keeping everyone warm. The very term ‘towpath’ alongside a canal or river, often used today for walking and cycling, is a reminder that these paths were once specifically for horses. Naturally, they accumulated a great deal of manure, and on the left-hand towpath by the bridge, the print shows a man by a horse and cart who seems to be holding a shovel, perhaps collecting manure, which was a valuable item that was sold to farmers outside London. A horse fitted with a draught harness is on the right-hand towpath, ready to pull a boat out of the lock when the water reaches the right level. There are two boats, but only one horse, implying that the horse belonged to the lock and pulled boats the short distance between the lock and the tunnel mouth. There were no towpaths in tunnels, so the boats’ horses had to walk round to the other end of the tunnel. Without horses, narrowboats had to be navigated through tunnels by two men laying on their side on planks projecting from each side of the narrowboat, so that their feet touched the tunnel wall of the tunnel. They dragged the boat along by walking sideways, in a process called ‘legging the tunnel’. For the boatmen, this was an everyday task – one that was hard and awkward, conducted in a damp and airless atmosphere and mostly in darkness. As a piece of engineering, a canal lock is extremely simple, and yet the process by which boats can rise or fall between one water level and another appears quite magical and can be mesmerising to watch. Once a boat from the lower level was within a lock and the gates shut, sluices were opened to allow water to flow into the lock from the upper level. The water in the lock rose, along with the canal boat, until the water in the lock reached the higher level and the gates could be opened to release the boat into the higher stretch of the canal. A boat entering the lock from the upper level was lowered by allowing water in the lock to flow out through sluices into the lower level. The emptying of a lock meant that water was lost from the upper level of the canal, which had to be replenished in canals. In the print, the winding gear for a sluice gate is shown on the island between the two locks. Prints were often copies of paintings, but were sometimes created from specially prepared drawings. In both cases there was often a degree of ‘artistic licence’ in making an attractive picture. Trees, buildings and even hills might be moved or changed in shape to suit the composition, so prints are often only a rough guide to the appearance of a locality. On the other hand, details within the prints had to be accurate or the print would be dismissed as fantasy. It is in the details of prints that lurks the evidence of everyday life – it is just a question of looking for it. We have a few talks lined up for our new book, Gibraltar: The Greatest Siege in British History. Any further events will be added to our events page. We will be taking part in the inaugural Historical Writing Festival at Lancaster, which is being held over the weekend of 28th and 29th October. Our talk (on ‘Gibraltar: The Greatest Siege in British History’) will take place in the early afternoon of Sunday 29th October, at 1 pm, at Lancaster Maritime Museum, Custom House, St George’s Quay, Lancaster, LA1 1RB. So forget your Sunday lunch and make your way instead to our talk. Tickets cost only £5 (£3 concessions), which are already on sale, from either of the two Waterstones in Lancaster, online or by phone. Details are on the Waterstones website. We are giving a talk on ‘Gibraltar: The Greatest Siege in British History’ on Wednesday 8th November 2017 at the library in Denmark Street, Wokingham, Berkshire, RG40 2BB, at 2 pm. A large car park is close by. Tickets will be available nearer the time from the library. We love this library and have given talks here before. We are delighted to be taking part in the 2017 Gibunco Gibraltar International Literary Festival. This is one of the most prestigious literary festivals and is set in the remarkable location of Gibraltar on the southern edge of Europe. It is not just for those living on Gibraltar, but is open to visitors from Spain, Britain and beyond. The festival extends over four days, providing a welcome excuse for a short break on the Rock. Several different venues are used, and the main hub is the Garrison Library, founded by John Drinkwater, as described above. As yet we don’t know what day our talk will be on or the venue, but information keeps being added to the official website. Our latest e-book is for the revised edition of the Handbook of British Archaeology, which is available in all e-book formats and is almost half the price of the paperback! So you can have a copy to hand even when on the most remote archaeological excavation. The paperback ISBN is 9781845296063. We had an article published in Folklife Quarterly 54 for July 2017 called ‘Poor Portraits and Broken Tokens’, which was based on songs relating to the problem of recognising someone after a long voyage. One group of songs is referred to as ‘broken token’ songs, where the returning sailor is not recognised by his beloved until he produces his half of a token. The family history magazine Who Do You Think You Are? produced a special Jane Austen edition in the summer of 2017, to coincide with the 200th anniversary of Jane Austen’s death and the publication of Northanger Abbey and Persuasion. Quite a lot of the articles concentrated on her era, including ones on militias, lawyers, marriage and one that we wrote, called ‘Focus on Nelson’s Navy’, which included details of her two navy brothers. Family history magazines are a great way of delving into fascinating and unusual aspects of history – you don’t need to be researching your own family history to enjoy them (though you may get lured into such research). In issue 130 (September 2017) of Who Do You Think You Are? magazine, pages 22­–5, we have a Gibraltar-related article, on the family of Colonel William Green, who was the Chief Engineer throughout the Great Siege, and his wife Miriam Watson. It describes the difficulties and discoveries in tracing their ancestry and life together, along with tips for tracing military and Gibraltar ancestors.